Indulge in citrus zest and invigorate your senses with a curated collection of bath‚ body‚ and personal care products that will cleanse and awaken you. 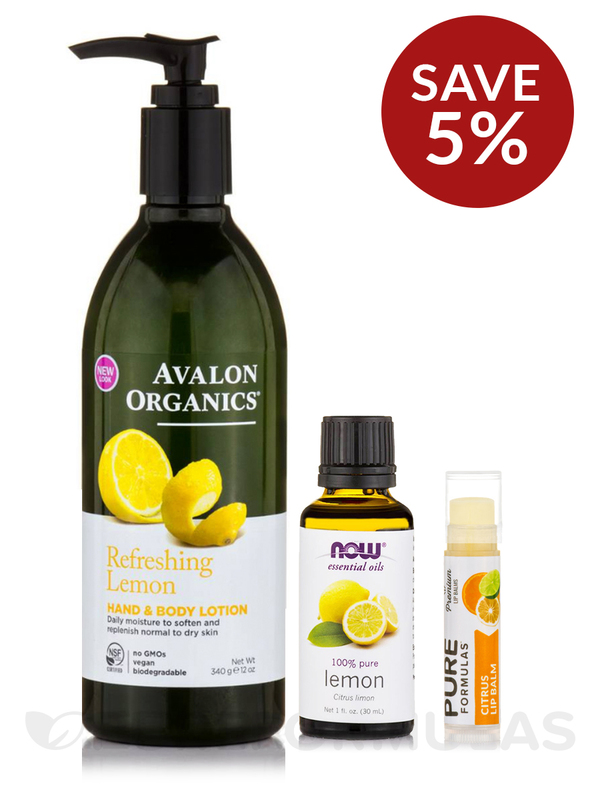 Even better -- you get to save 5% on these items when purchased together‚ and we’ll include an exclusive essential oil recipe card profiling the scent and exciting DIY project you can make using it. 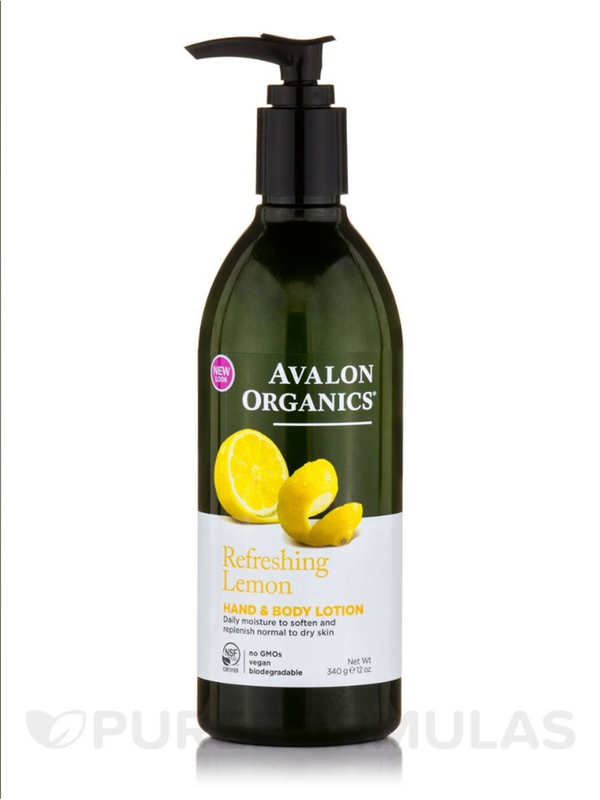 Organic Lemon Hand and Body Lotion 12 oz (340 Grams) from Avalon Organics keeps your skin soft and supple. This vegan hand and body lotion rebalances and nourishes your skin. Citrus Lip Balm from PureFormulas is made with organic beeswax and infused with a citrus essential oil blend to make your lips smooth and soft‚ and it will work to protect them against cold weather and other harsh elements. 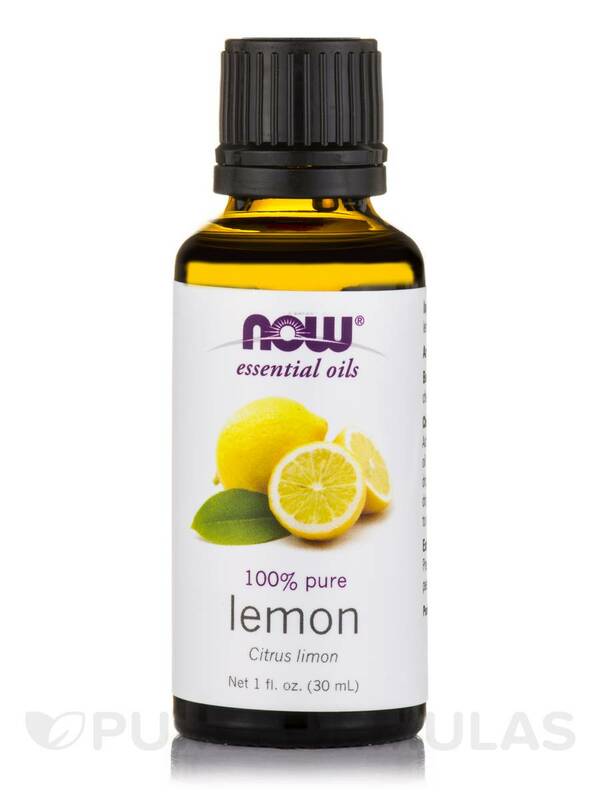 Lemon essential oil from NOW is 100% pure and will work to refresh and uplift your senses. Purity Tested / Quality Assured. Aqua (Water)‚ Aloe Barbadensis Leaf Juice(1)‚ Glycerin‚ Carthamus Tinctorius (Safflower) Seed Oil(1)‚ Glyceryl Stearate SE‚ Stearic Acid‚ Avena Sativa (Oat) Bran‚ Beta-Glucan‚ Calendula Officinalis Flower Extract(1)‚ Chamomilla Recutita (Matricaria) Flower Extract(1)‚ Citrus Limon (Lemon) Peel Extract(1)‚ Styrax Benzoin Resin Extract‚ Butyrospermum Parkii (Shea) Butter(1)‚ Cedrus Atlantica Bark Oil‚ Citrus Aurantifolia (Lime) Oil‚ Citrus Aurantium Dulcis (Orange) Oil‚ Citrus Grandis (Grapefruit) Peel Oil‚ Citrus Limon (Lemon) Peel Oil‚ Cocos Nucifera (Coconut) Oil(1)‚ Linum Usitatissimum (Linseed) Oil(1)‚ Litsea Cubeba Fruit Oil‚ Olea Europaea (Olive) Fruit Oil(1)‚ Persea Gratissima (Avocado) Oil(1)‚ Arginine‚ Bisabolol‚ Caprylic/Capric Triglyceride‚ Cetyl Alcohol‚ Potassium Hydroxide‚ Sodium Hyaluronate‚ Sodium Stearoyl Glutamate‚ Stearyl Alcohol‚ Tocopheryl Acetate‚ Xanthan Gum‚ Alcohol(1)‚ Benzyl Alcohol‚ Potassium Sorbate‚ Sodium Benzoate‚ Cinnamyl Alcohol‚ Citral‚ Geraniol‚ Limonene‚ Linalool. Non-GMO / Vegan / Vegetarian / Paraben-Free / Preservative-Free / No Synthetic Colors or Fragrances / Phthalate-Free / No Animal Testing / Cruelty-Free. Organic Sunflower oil‚ organic beeswax‚ organic coconut oil‚ organic essential oils of orange‚ lemon and lime‚ Vitamin E‚ organic rosemary extract‚ organic calendula extract. For aromatherapy use. For all other uses‚ carefully dilute with a carrier oil such as jojoba‚ grapeseed‚ olive‚ or almond oil prior to use. Please consult an essential oil book or other professional reference source for suggested dilution ratios. Cheer Up Buttercup Blend: Add 1 drop each of lime oil and grapefruit oil‚ 2 drops of lemon oil and 6 drops of tangerine oil. Add to a diffuser and enjoy. Notice: Natural essential oils are highly concentrated and should be use with care. If pregnant or lactating‚ consult your healthcare practitioner before using. Do not use on skin. Reacts strongly to sunlight and other sources of ultraviolet light.